A.V. 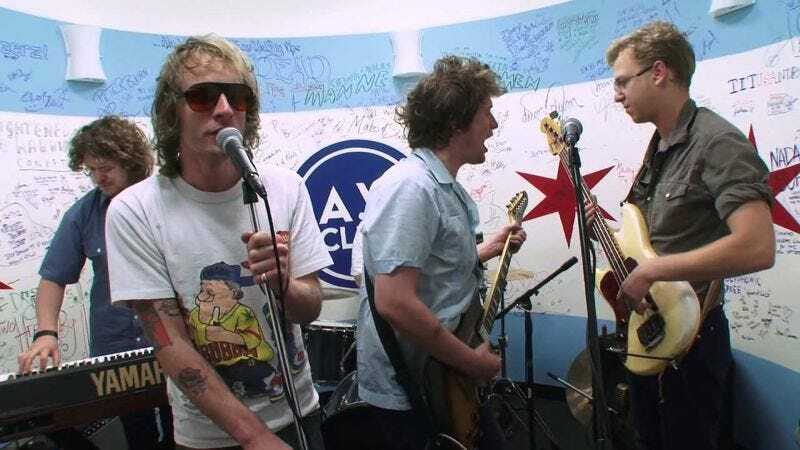 Undercover alumni The Hold Steady and Deer Tick are kicking off a tour together tonight in Boston, and in celebration of their mutual love, the bands have each recorded a cover of the other’s song—and we’ve got the exclusive streams. Deer Tick did an excellent job with The Hold Steady’s “Constructive Summer,” while The Hold Steady returned the favor with a version of Deer Tick’s “Easy.” Deer Tick’s Ian O’Neil told us: “Craig Finn can bring you right back to the time in your life when partying went hand in hand with ambition. ‘Constructive Summer’ reminds me how rock and roll’s simplicity gives power to heart instead intellectualism.” Finn responded thusly: “I think that ‘Easy’ was the first Deer Tick song I ever heard and I’ve always thought it had a really cool vibe. It gives me the chills when John [McCauley] does that line about the devil in his eyes. The song is classic Deer Tick, it’s rock and roll that’s passionate and knowing.” We can only assume that this love affair will manifest itself further on these tour dates, which are all listed below, after the song streams. Enjoy.